Tell us about yourself: I love being the character I cosplay, not just being in costume. Because I'm an actor, this makes playing these characters so much fun. 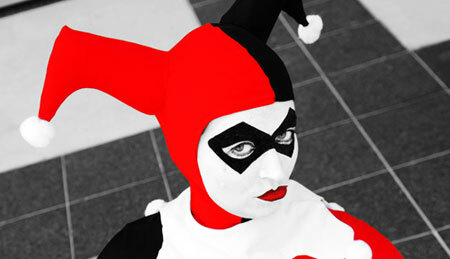 Being mean to people when cosplaying the Malfoys, acting like a nutcase as Harley Quinn. My husband and I also have an Improv company and we do geeky improv on a regular basis, it's always fun to get geek related suggestions from the audience. Cosplay has become a passion now, watching new things and saying "I wanna do THAT costume", doing obscure costumes and seeing how many people know what it�s from, learning more about sewing and going to the cons, appreciating other costumes and having people appreciate yours. It's great fun. Have you always been a geek? : I watched ST:Voyager and The Adventures of Lois and Clark in high school, but I only became a full-fledged geek when I started seeing my now husband, who I cosplay with on a regular basis. We cosplay, collect and geek out together, and now we have a little one who we plan to costume as well. Geekiest thing about you: I'm pretty geeky all around, it's hard to pick out one thing.